There are many tools that are designed to help complete the fabrication of small parts in the punch press. What benefits are there to completing small parts in your machine? Square EasySnap™ – Similar application to Square ShearButton, but for thinner materials. Square ShearButton™ – For quick, clean parts separation on thicker materials. Sheetmarker™ – Ideal for inscribing or marking components during the punch press portion of the manufacturing process. Rollerball Deburr™ – Helps eliminate costly secondary operations. Pushes away burr and creates a radius on the side of the part. 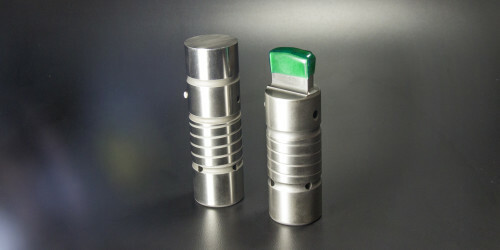 Can be used with materials of any thickness in mild steel, stainless steel and aluminum. Mate EasyTap™ – Produces threaded holes in a single punch press set-up. HexLock™ – An innovative forming assembly engineered to provide a reliable and secure method of retaining common threaded fasteners in sheet metal. SnapLock™ – A Lance and Form assembly that provides a self-locking, spring loaded tab that snaps securely into a pre-punched hole. Eliminates expensive secondary operations such as spot welding, riveting or fastening with threaded hardware.